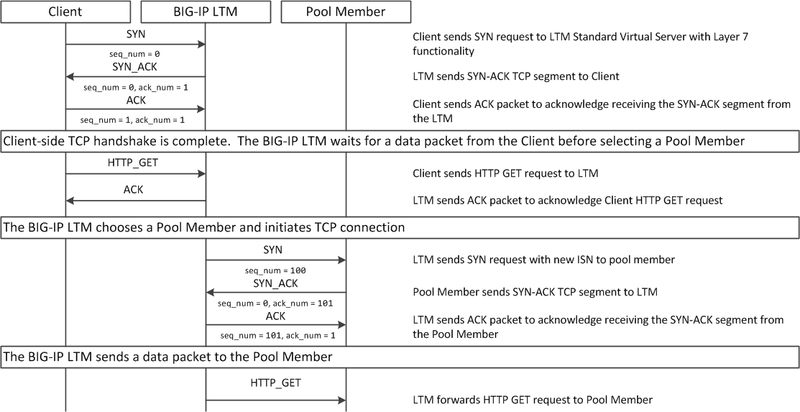 Standard TCP + L7 profile (e.g. HTTP): Main principle – TCP handshake on the server side won’t start until the client sends first L7 request. This is the most flexible and popular type for HTTP/HTTPS traffic allowing all features which BigIP is so loved for around the world! The sky is the limit for iRules on Standard VSs! Very good use scenario from my perspective would be a VS for a pool of web servers supplying “dumb” static content where you just need pure performance and no intelligence available with the standard VS and “normal” HTTP profiles.